With 10 of the 21 races down, arguably more questions have been raised than answers over which direction both Formula 1 championships are swinging. Mercedes, Ferrari and Red Bull all have potentially title-winning cars. Behind, Haas and Renault have taken the march at the front of the midfield, ahead of McLaren and Force India. 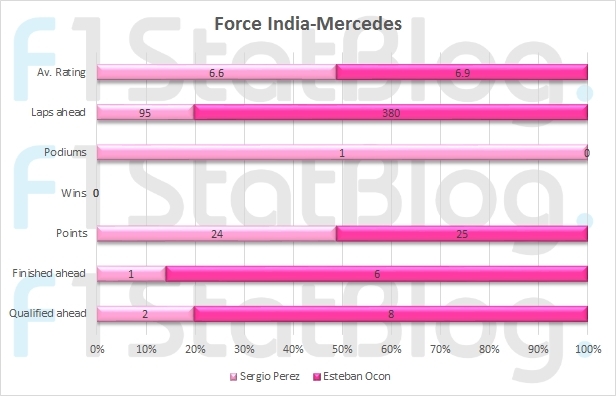 Sauber is arguably punching above its weight, while Toro Rosso and Williams are at the wrong end of the table. One thing which can be easier to identify, is the winners and losers of the respective intra-team battles. While the statistics do not always tell the story, as is the case in this year, there are a lot of stories to be taken from the races so far. In addition to wins, podiums, points, laps ahead, qualifying and race finishes, each driver is also given a (of just one opinion) average rating out of 10 given at the end of each grand prix weekend. Perez has often been the strongest driver in the midfield in recent years but 2018 has been slightly different. He stunned with a ‘how the hell did that happen! ?’ podium in Azerbaijan when everybody else seemed to lose their heads, but that has very much been the sole highlight of the year. In complete contrast to 2017, qualifying has often been the Mexican’s weakness this year. He has also been the driver who has finished behind his team-mate more often than anybody this season. He’s beaten Ocon just once, but the gap sometimes isn’t much. From clumsily wiping a Ferrari out to crushing the midfield opposition within the space of just a few weeks, Ocon is another driver who has had an up-and-down season. However, he has often been ahead of his team-mate Perez, which is what counts at the end of the day. He wasted a potential podium opportunity at Azerbaijan and got tangled up with fellow Frenchman Pierre Gasly at his first home grand prix, which arguably both should have been avoided. Like Hulkenberg, the average rating probably doesn’t do Ocon quite as much justice as it should. It is tough to work out where it’s going wrong for Vandoorne. He claims that the gap between him and his team-mate – two-time champion Fernando Alonso, isn’t as big as it may seem, but one thing has consistently been the case – Alonso has been ahead. Every qualifying session, every race session where both cars have finished and pretty much every lap has been led by Alonso. 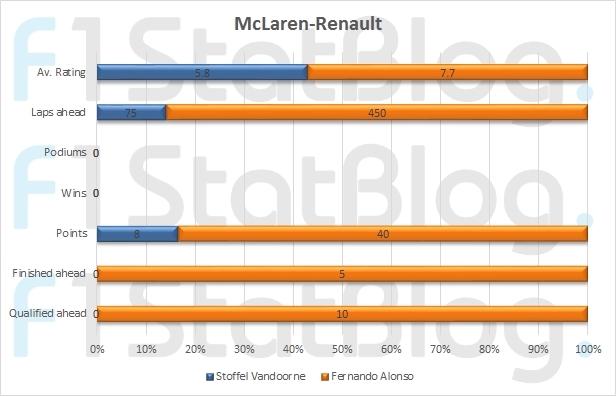 There have been weekends where Vandoorne has regularly looked several tenths off Alonso. This is odd considering he started to look like the real deal at the end of 2017. If Alonso does retire, Vandoorne is not looking like the driver to push McLaren forward. Is his future at risk? Has this been Alonso’s best season? No. Not by a long way. It was clear that he was absolutely exhausted at the French Grand Prix, hosted a week after he won the 24 Hours of Le Mans with Toyota. It was the first time in a long time that Alonso really struggled during a race. But otherwise, he has dragged the McLaren into places it often does not deserve to be – especially in the races. Despite destroying his team-mate in qualifying 10-0, there does seem to be times where it seems like the McLaren is out of position on the grid. His time in F1 may be limited as he becomes more frustrated at where he finds himself, but he remains one of the best around. Gasly has had a quietly-impressive rookie campaign. He can be excused for making rookie errors at times, although he has also committed the ultimate sin in motorsport by taking his team-mate out (in China, which led to the barnstorming finish we witnessed there). 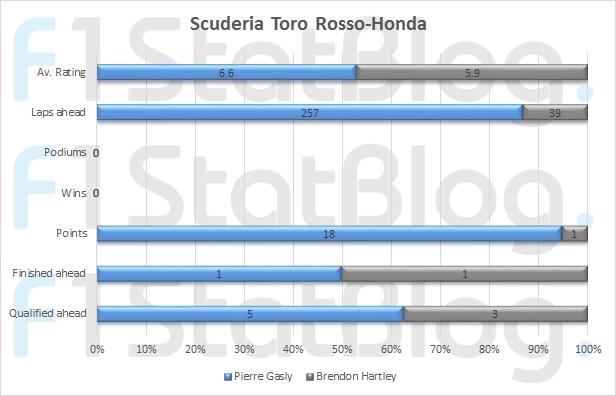 Life with a Honda power unit is not always easy, but there have been times where Gasly has shown some serious potential – a stellar run to fourth in Bahrain is an obvious highlight, while his run from last to just shy of the points in Canada went very much unnoticed. Brendon Hartley is a phenomenal racing driver – his very successful time in the World Endurance Championship proves that. But it is simply not working out for him in F1. His luck this season has been absolutely terrible, and when it looks like he is about to finally string a decent weekend together, it doesn’t quite work out that way. The statistics do not look good, and rumours will not disappear that his time in F1 is painfully limited. There have been flashes of potential shown, but there needs to be a few weekends strung together. As Sauber has rejuvenated under Frederic Vasseur, Ericsson himself has found himself hitting a good run of form. Recent results do not read too well against him, especially compared to his team-mate, but he is now a regular points threat in a car which is moving from the rear of the field into the midfield proper. It almost seems ironic that this is the best Ericsson is driving so far, yet he finds himself regularly being beaten by the guy in the other car. The immense raw talent that is Ferrari’s hot property took a little while to get acquitted into F1, but when the pieces fell into place, boy did this young star produce. 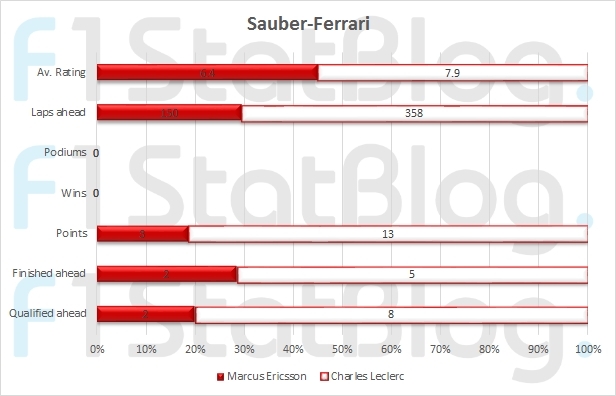 The Sauber is probably not a Q3 car – Leclerc has been there twice. The Sauber is not a car that should be in the points as often as it isn’t – it is in Leclerc’s hands and feet. The speed is there. The skill is also there, as has been evident when he has gone wheel-to-wheel with the likes of Alonso. Leclerc is destined to end up in a Ferrari sooner or later. And it is looking more likely that it will be after just one season. That is how good this guy is. Ferrari’s answer to Max Verstappen and Esteban Ocon is growing by the race, and will be a serious challenge to Vettel. Easily the most impressive rookie campaign for many years. The Williams has not been the easiest car to drive, and to his credit, Lance Stroll has occasionally performed some moments which were jaw-dropping. Once again, he kept his cool as others lost their heads at Azerbaijan and brought the car home in what has turned out to be the team’s only points-paying position so far. He has also made some truly exceptional starts – almost former team-mate Felipe Massa-esque. 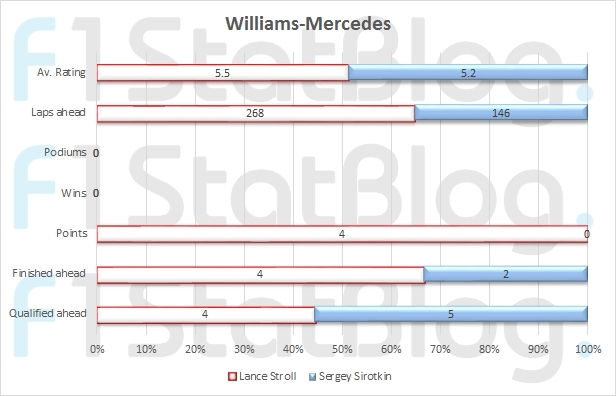 But the fact is that the Williams is the worst car on the grid, and the overall frustration relates in the performance. The only driver yet to score in 2018 has had a difficult rookie season. The car is not the easiest for an inexperienced driver, but there have only been occasional flashes of Sirotkin’s talent. His Monaco weekend was looking absolutely sensational, before car problems completely eradicated all hopes of scoring points. Other than that, he has often kept Stroll honest, but has usually lagged behind his slightly-more experienced team-mate.